Andrea Mustain is a journalist, producer, editor, and strategist. 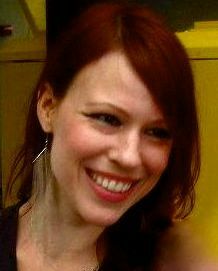 She is the currently the executive producer and host of the podcast Raw Data, from Stanford and PRX. She is also a film producer, and has been working on the same documentary for a really long time. She has been the science editor for PRX, worked as a lead strategist at a Fortune 100 tech company, written for WNYC’s The Takeaway, taught courses on writing, reporting, and editing for radio at the Columbia University Graduate School of Journalism, and covered high-energy particle physics at Fermilab. Her work has appeared in Scientific American, The Christian Science Monitor, Yahoo! News, NBCNews, Symmetry magazine, among others, and on PRX and the public radio program Marketplace. She spent many years working in the performing arts and film, both behind the scenes as a stagehand for Blue Man Group and as an actor, but, in search of a far more lucrative and dependable career, chose journalism. A native of Central Illinois, she spent a lot of time pollinating soybeans and corn in her youth. She holds degrees in theater and Russian language and literature from Northwestern University, and received her M.S. from the Columbia University Graduate School of Journalism. She feels a little weird writing about herself in third-person, but finds that slightly less horrifying than writing all this in first-person, since that would go against all her Midwestern sensibilities.